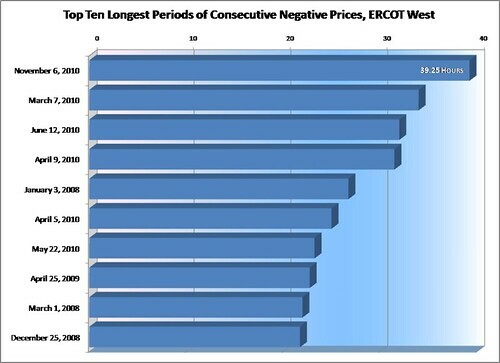 ERCOT recently set a new record for consecutive pricing intervals below $0/MWh for balancing energy market prices in the ERCOT West region: 39.25 hours of negative prices. The episode started at 7:45 PM on Saturday, November 6 and the negative prices continued until 11:00 AM on Monday, November 8. The previous record of 34 hours began at 11:15 PM on Sunday, March 7, and continued until 9:15 AM on Tuesday, March 9. Most of these records begin on weekends or holidays and are the product of low electrical load and high wind power output in conjunction with other system factors. Notably, while the overall frequency of negative pricing intervals is down from 2008, 6 of the top 10 periods (and 4 of the top 5 periods) with continuous negative prices are in 2010. IN (SOMEWHAT) RELATED NEWS: ERCOT is still on track for the switch to a nodal market design, coming up on December 1. The change should allow for more efficient use of the generation fleet connected to ERCOT and more efficient use of the transmission grid. All that added efficiency (even if only 1 or 2 percent improvements) should add up to slightly lower prices on average. More effective use of the transmission grid should reduce the congestion that contributes to negative prices in the ERCOT West zone, but it is a complex switchover so to some degree we will just sit back, watch and learn. Another potential impact of the upcoming nodal market may be a divergence of the number of intervals with negative prices within the West Load Zone. There is still too much wind output for the amount of transmissoin lines leading out of West Texas, but the impacts could be more localized.